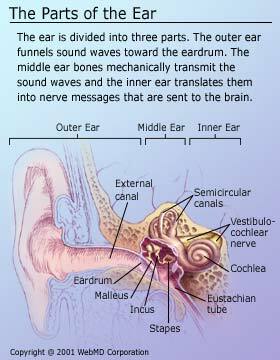 Tinnitus is the perception of a sound that is being heard in the head or the ears. The word Tinnitus comes from the Latin word for "ring." Tinnitus is unrelated to any external source. Sound that is only heard by the patient is called subjective Tinnitus, while sound that can be heard by others is called objective Tinnitus. Conservative estimates are that patients with complaints of tinnitus range from 10 - 15% of the population, which is equivalent to millions of people. Of those that present with ear-related symptoms, 85% report experiencing tinnitus as well. Tinnitus can affect both adults, and children. Many people experience tinnitus after being exposed to the sound of gunfire, or firecrackers, or after attending a loud concert, with modern amplification. This type of tinnitus is annoying, but, usually goes away after a few hours. It is important to always protect your ears from loud noise, by using any variety of ear plugs. Since tinnitus is a symptom, and not a disease, it reflects an underlying abnormality. Typically, then, tinnitus is associated with a sensorineural hearing loss. Tinnitus that is pulsatile, associated with vertigo/dizziness, or unilateral sudden tinnitus should be investigated medically. Subjective tinnitus is the most common type, whereas objective tinnitus is relatively rare. Because objective tinnitus can be heard by the physician, in the absence of physical matter in the ear canal, it may be caused by something related to the ear, the head, or the neck. 1) muscular, and 2) vascular problems. Vascular tinnitus is frequently observed as an anomaly of the carotid artery. This is not an unusual consequence of aging. The patient typically "hears" this form of tinnitus as a heartbeat. It, therefore, is described as a low- pitched sound, rather than the more common ringing. Vascular tinnitus should be discussed with your physician. Several over-the-counter drugs can be a source of tinnitus, or may increase the tinnitus, if it already exists. Asprin, or aspirin containing compounds, in high dosages, often cause tinnitus. Tinnitus is also a side effect of nonsteroidal anti-inflammatory drugs, in nearly every case. Like aspirin, it appears to be dose related. Diuretics are also known to produce dose related tinnitus. It is usually reversible, but may become permanent in some patients. Permanent hearing loss, and tinnitus is frequently observed with the Administration of ototoxic chemotherapeutic agents such as the various heavy metal platinum compounds. Tinnitus is a serious issue, and may mask an urgent underlying medical condition. Pulsatile one sided tinnitus may suggest to the physician the presence of a glomus, or cerebellopontine angle tumor. Fluctuating tinnitus, tinnitus associated with dizziness/vertigo, and fluctuant hearing loss may suggest Meniere's Syndrome. Usually, patients simply need to know that their tinnitus is not caused by a serious illness. A physician, especially one specializing in otology, can provide this reassurance after the completion of some studies. In the absence of a disease entity, amplification with hearing aids may provide relief in more than 50% of patients. The American Tinnitus Association (ATA), based in Portland, Oregon, is one of the best known organizations providing support for tinnitus sufferers. For information, go to www.ata.org.